When the farmer’s market is the farm you know the produce will be good. Just picked from the garden, the vegetables and fruit are fresh. This is the way to purchase corn on the cob. It is best when picked and eaten the same day. Our family is scattered all over the country. 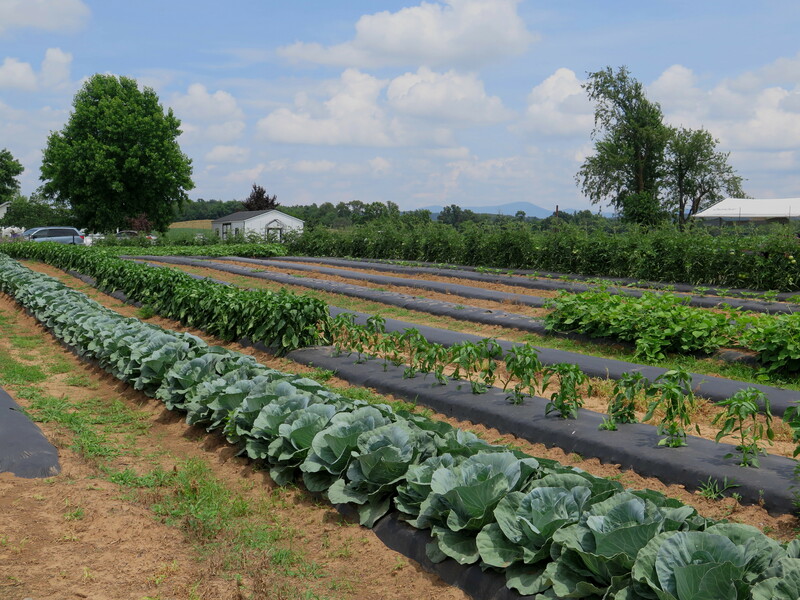 When we return home to the Shenandoah Valley, this local farm’s produce stand is something we always seek out. The Shenandoah Valley in Virginia is a beautiful part of the country. And it is still very rural with lots of agriculture. We have a favorite produce stand by the side of the road on the farm itself. Someone in our family is always willing to get up early to make it to the farm before that day’s corn supply sells out. It has become a family ritual. You probably have some. I visited the Shenandoah Valley at the end of June for a high school class reunion and took these photos. Couldn’t resist purchasing several ears of corn to bring back home with me to Louisiana on the plane. 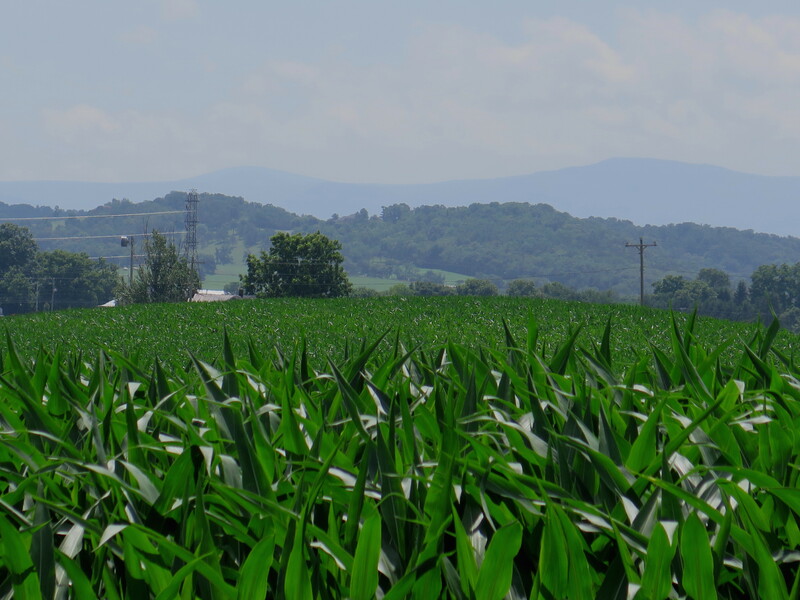 Here’s photo looking east towards the Blue Ridge mountains with the Skyline Drive Parkway taken from the farm with the corn in the foreground. The cover photo is of Massanutten Mountain which runs down the middle of the Shenandoah Valley. The variety of corn sold at this farm is especially sweet. It is a bi-colored corn variety. But the sugar, sweetness and flavor in the corn begins to change to starch as soon as the cobs are picked. By the end of the day the corn has lost much of its sweetness and flavor. So purchase just what you can boil in a day. Very simple actually. Don’t refrigerate the cobs, just keep them in a cool place until ready to cook. Then husk the ears removing the silk. (Do this while the water is coming to a boil). Bring the water to boiling in a large pot. The pot should be large enough to submerge the ears. Add the corn, return to a boil, let boil 2 – 3 minutes and then turn off the heat. The corn can set in the water; but only for a few minutes. Remove the corn from the water. That’s it! The ears should still be crisp. They don’t need to boil very long or they will begin to become tough. (if you are wondering if you have cooked the corn long enough, you’ve probably over-cooked it.) Enjoy! Rarely do we have leftover corn. It is good re-heated. But in the event that you do have some left over, there are many ways to use the corn. Cut it off the cob with a sharp knife. 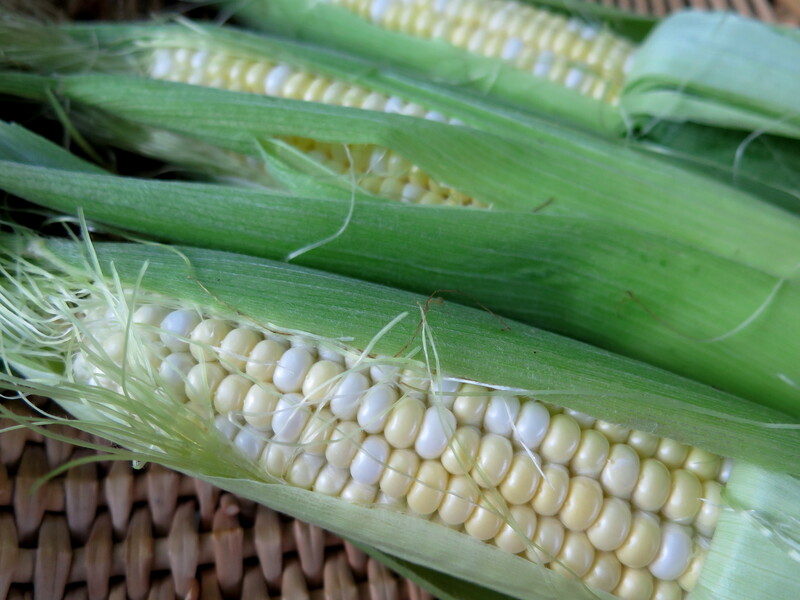 Corn can be added to a salsa, corn soup, creamed corn, sauteed with onions, tomato and okra, for example. My Iowa grandmother even made corn pancakes for breakfast. Here is a simple recipe for “Corn and Jalapeno Soup with Lump Crab Meat.” The crab meat is expensive; I add it only for special occasions. The soup is tasty without the crab meat, too. The jalapenos are ones I grew in my garden. If green jalapenos are allowed to stay on the vine, they turn red. Since I pick the peppers as I need them, some stay on the vine longer than others and turn red. They make a pretty addition to the soup. Green jalapenos can be used, too. I seed the peppers so they are not so “hot.” Serrano peppers can also be substituted. Many recipes for corn and crab meat soup call for heavy cream. I lighten things up a bit by using whole milk and half-and-half cream. It is still plenty rich! Using a sharp knife, cut the corn off the cobs, should be about 2 cups, set corn aside, (If juice is scraped while cutting the corn, add this too). Add the onion and jalapeno peppers (or Seranno peppers) to the butter. Stir and cook over medium high heat about 5 minutes until the onion is translucent. Turn heat down, if needed, to avoid burning the onions. Turn heat to low, add the flour and stir constantly (I use a wooden spoon) until combined. Remove the pot from the heat. Slowly add the milk, stirring constantly to avoid flour lumps. Slowly add the half-and-half cream and stir. Return to stove, over low to medium heat, cook and stir until the soup becomes bubbly. Add the reserved corn and the lump crab meat. Stir until heated through. If you are lucky enough to have a farm with a produce stand close by, summer is the time to visit it. We have a large farmer’s market in the downtown city that brings the garden produce to us each Saturday. And we have several “Fresh Pickin’s Markets” with local farm vegetables and fruit for sale. So enjoy some really fresh corn on the cob this summer! 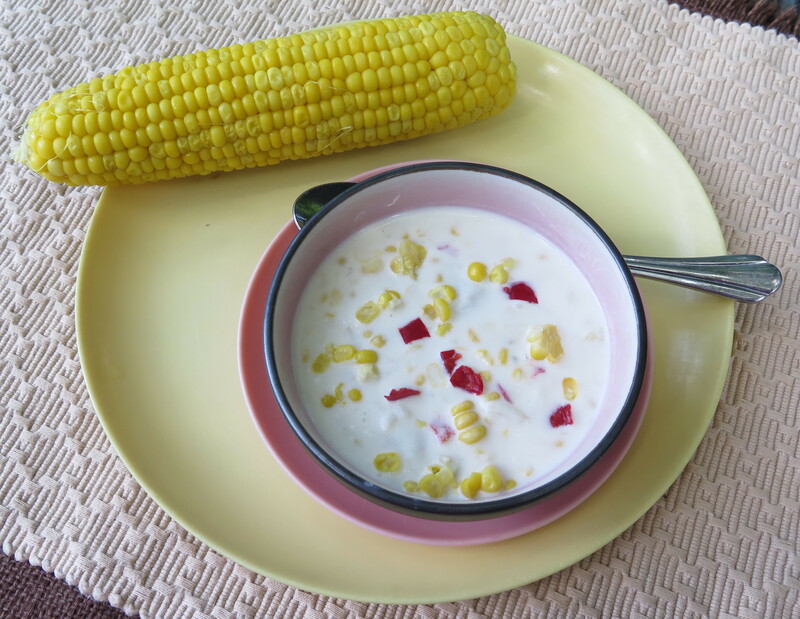 This entry was posted in Recipes, Travels and tagged corn and jalapeno soup, corn on the cob, farmers market, farmers market at the farm, how to cook corn on the cob, lightened version of corn and crab meat soup, Shenandoah Valley by Maylee at Beyond Gumbo. Bookmark the permalink.